Crunchy yummy nuts shell for a yummy spicy cake! First of all, excuse the quality of the pictures here. I only decided this will be fab to share when I was in the middle of making the cake so had to use ‘zee phone….but not bad ehh?. I had some sisters come over with their babies about 2 weeks ago and yet again it fell on me to do the dessert…surprised? Yeah me too 😉 :-D. I wanted to make some’in cozy and warm and spicy and Autumn-like and thought, apples just scream Autumn!, don’t they? So I decided to go for it. 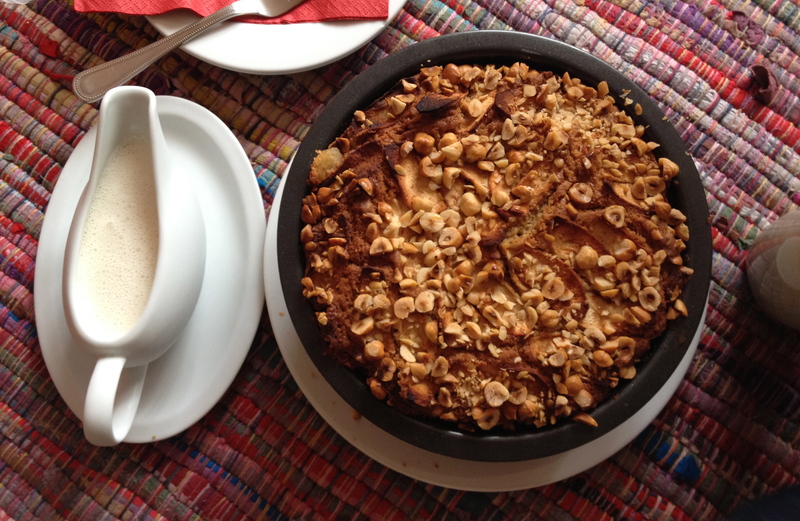 Here we have a spicy apple cake, packed full of apples with a generous hazelnut top. The hazelnut top was an inspiration from a BBC good food on their Apple Cake in a nutshell shell recipe. A really good recipe that. Warning: This cake is seriously nutty, light, delicious and just fills your mouth with spices that remind you of Christmas. A bit too yummy that I didn’t get to take the picture of a proper piece until I got to the very last one in the tin. There is a seeded version of this (for those allergic to nuts) at the bottom of the cake page so keep reading :-).